, president of the college of New Jersey, and a divine of very considerable fame in America, was descended from English parents who emigrated in the reign of queen Elizabeth, and was born, Oct. 5, 1703, at Windsor, in the province of Connecticut in North- America. In 1716 he became a student of Yale college, and received the degree of B. A. in 1720, before he had completed his seventeenth year. 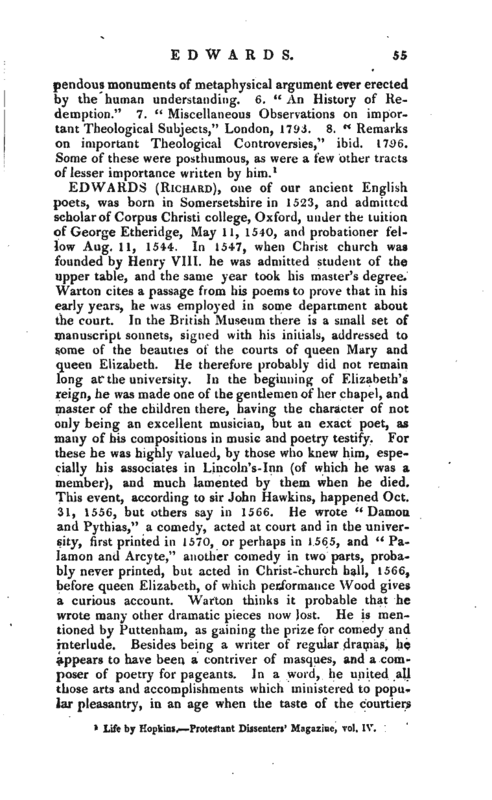 His mental powers are said to have opened themselves so early and so strong, that he read Locke’s “Essay on the Human | Understanding” with delight, in his second year at this college. After taking his bachelor’s degree he remained two years more at college preparing himself for the ministry, and after the usual trials, was licensed to preach. 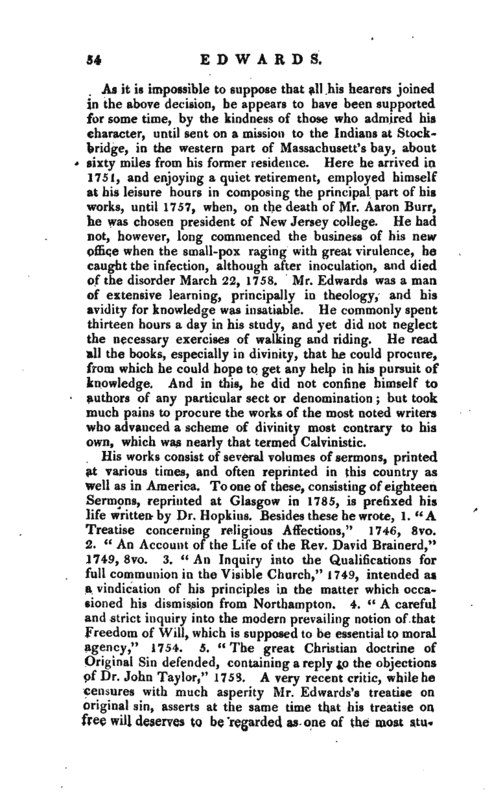 In August 1722 he was invited to preach to the English presbyterians at New York, where he continued with approbation above eight months; but as this society was too small to maintain a preacher, he returned in the spring of 1723 to his father’s house at Connecticut, where, for some time, he applied to his studies with great industry and perseverance; and severe application became habitual to him, although he was of a delicate constitution. In the spring of 1724, having taken his master’s degree, he was appointed tutor of Yale college, and notwithstanding his youth, and the time necessary to be devoted to his own improvement, he filled this office for two years in a manner which afforded his superiors no reason to repent of their choice. He would probably have remained longer here, had he not received, in Sept. 1726, an invitation from the people of Northampton in Connecticut, to become assistant to his mother’s father, Mr. Stoddard, who was the settled minister of the town. 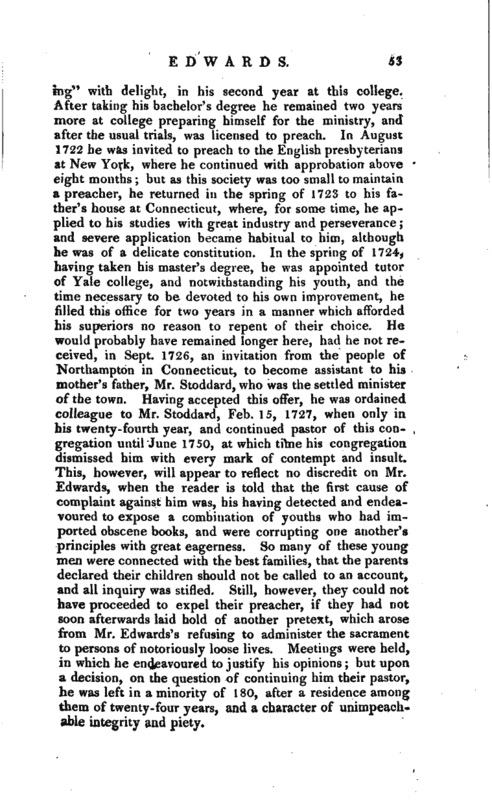 Having accepted this offer, he was ordained colleague to Mr. Stoddard, Feb. 15, 1727, when only in his twenty-fourth year, and continued pastor of this congregation until June 1750, at which time his congregation dismissed him with every mark of contempt and insult. 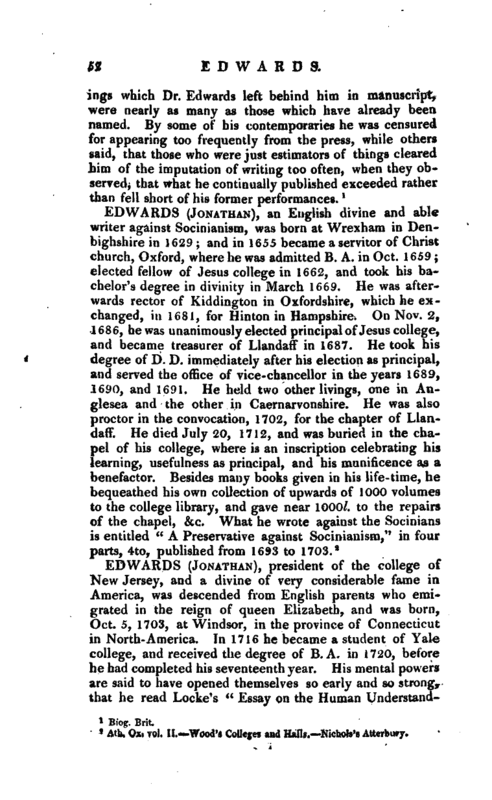 This, however, will appear to reflect no discredit on Mr. Edwards, when the reader is told that the first cause of complaint against him was, his having detected and endeavoured to expose a combination of youths who had imported obscene books, and were corrupting one another’s principles with great eagerness. So many of these young men were connected with the best families, that the parents declared their children should not be called to an account, and all inquiry was stifled. Still, however, they could not have proceeded to expel their preacher, if they had not soon afterwards laid hold of another pretext, which arose from Mr. Edwards’s refusing to administer the sacrament to persons of notoriously loose lives. Meetings were held, in which he endeavoured to justify his opinions; but upon a decision, on the question of continuing him their pastor, he was left in a minority of 180, after a residence among them of twenty-four years, and a character of unimpeachable integrity and piety. | As it is impossible to suppose that all his hearers joined in the above decision, he appears to have been supported for some time, by the kindness of those who admired his character, until sent on a mission to the Indians at Stockbridge, in the western part of Massachusett’s bay, about sixty miles from his former residence. Here he arrived in 1751, and enjoying a quiet retirement, employed himself at his leisure hours in composing the principal part of his works, until 1757, when, on the death of Mr. Aaron Burr, he was chosen president of New Jersey college. He had not, however, long commenced the business of his new office when the small-pox raging with great virulence, he caught the infection, although after inoculation, and died of the disorder March 22, 1758. Mr. Edwards was a man of extensive learning, principally in theology, and his avidity for knowledge was insatiable. He commonly spent thirteen hours a day in his study, and yet did not neglect the necessary exercises of walking and riding. He read all the books, especially in divinity, that he could procure, from which he could hope to get any help in his pursuit of knowledge. And in this, he did not confine himself to authors of any particular sect or denomination; but took much pains to procure the works of the most noted writers who advanced a scheme of divinity most contrary to his own, which was nearly that termed Calvinistic. 1 Life by Hopkins. Protestant Dissenters’ Magazine, vol. IV.